Ah Choobee... Always trying to get me moving in directions that I would rather not. Okay, I'll explain. You see, Choobee, much like the people who believed the Earth was flat, thinks there is a vast wasteland East of Main Street. Hence, she primarily spends her time in either Richmond or the West side of Vancouver. So whenever there is a restaurant decision to be made, Surrey would be equivalent to the end of the Earth. 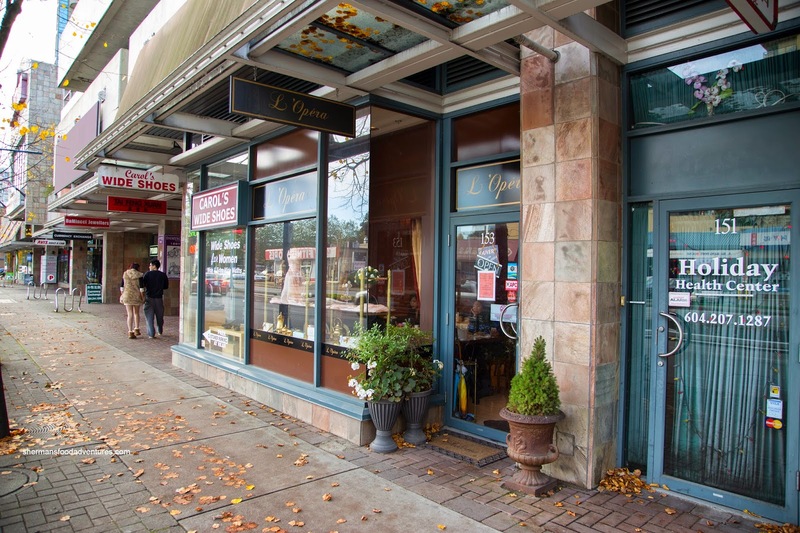 Therefore, I wasn't one bit surprised when she went on and on about L'Opera Patisserie in Richmond. Oh great, get me to go to Richmond again eh? Oh fine, so we did and I ended up picking up a variety of treats. 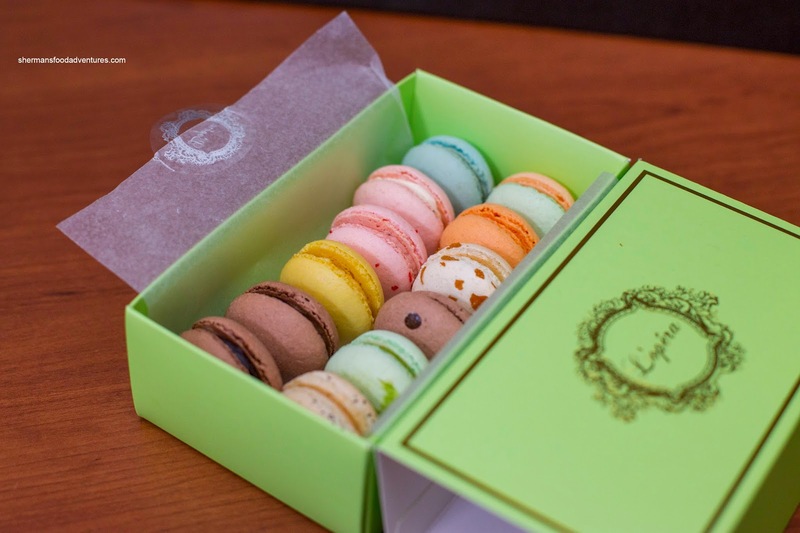 When asked which box I would like for my dozen of Macarons, I was given the choice of a green or black box. To which replied, I would like the green as the other one reminds me of an early 90's dance group. Then that is where I broke out into song... "Strike it up, this band is gonna play my tune...". Choobee and the girl at the counter began to look at me like I was Randy Quaid. Anyways, the petit macarons were pretty good. The lightly crisp exterior gave way to a soft interior. I would've liked to see it slightly chewier, but it was okay nonetheless. Flavourwise, they were natural-tasting while being only purposefully sweet. The little surprises in the middle only added to the enjoyment. I initially planned on eating one of the 2 Croissants I bought, but my son loved it so much, he took the other half of mine. I don't blame him because it as flaky and crunchy with a light airy and buttery interior. This was a surprisingly good version. 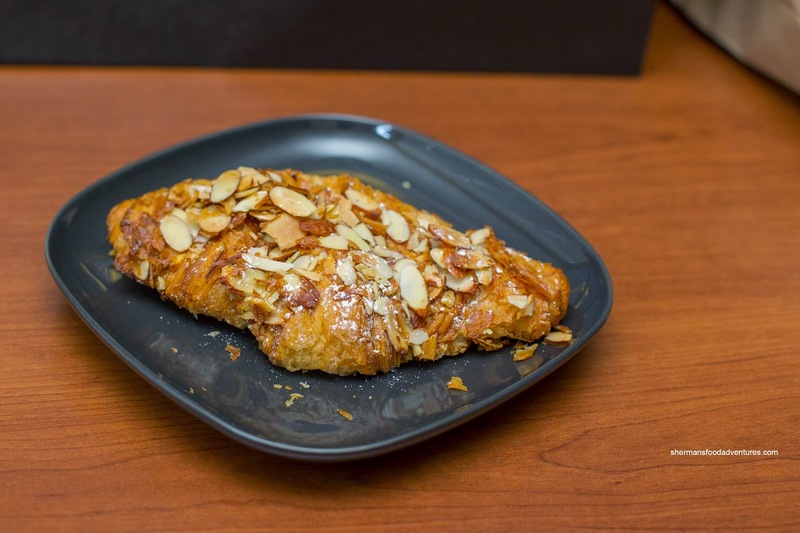 As for the Double-Baked Almond Croissant, it was also quite good except being a bit "flat". The exterior was once again crispy and sweet with plenty of slivered almonds. Inside, it was predictably denser with a controlled sweetness. I thought this was good, but not as good as the butter croissant. I think the one at Thomas Haas is the one to beat. 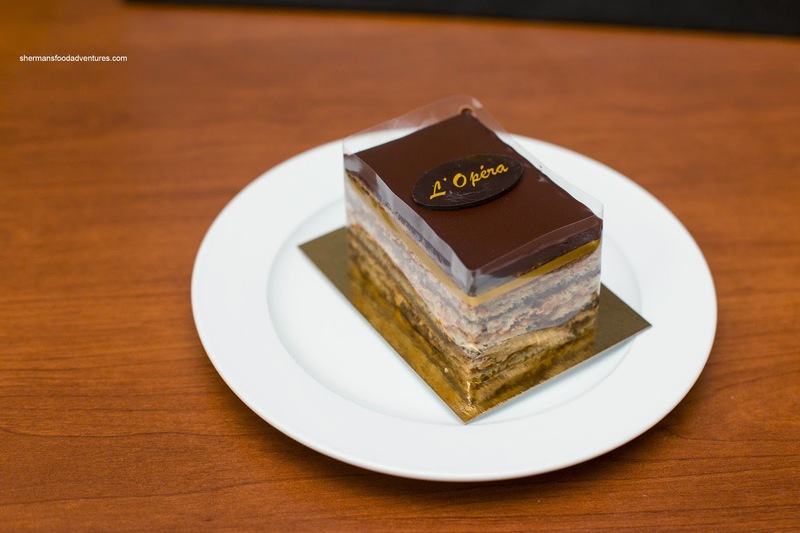 The Opera Cake, being the namesake of the place, lived up to expectations as it was good. The rich and silky dark chocolate on top revealed evenly distributed layers of hazelnut cream and cake which was aromatic, but hardly sweet. The flavours really came through without the intrusion of excess sugar that would have ruined the dessert otherwise. 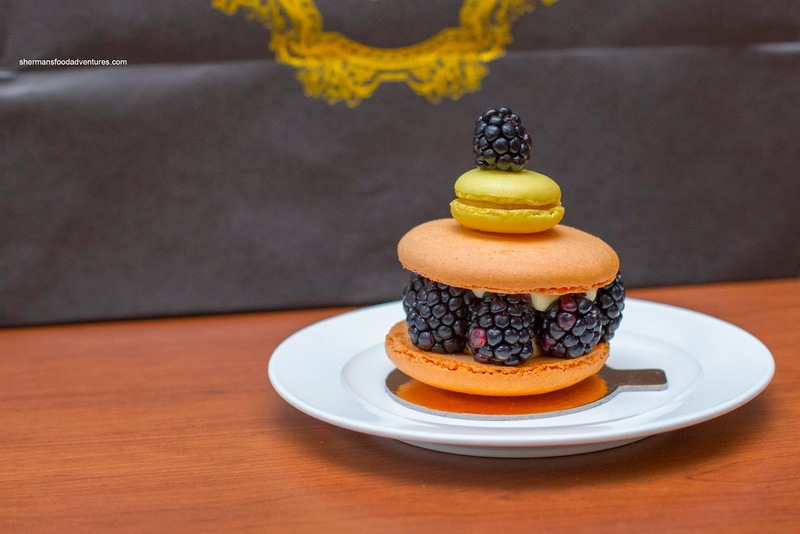 Due to my daughter's love of macarons, I had to get the Princesse Malibu which featured 2 large macaron shells filled with vanilla bean custard, blackberries, peaches and almonds. To literally top it off, there was a lemon macaron on top. Of course this was difficult to eat, but my daughter happily ate it. I wrestled a bit away from her and it was a good combination of fruit, smooth custard and different textures. Well, I gotta admit I was impressed with the selection I brought home from L'Opera. Honestly, I wasn't expecting a whole lot, but these sweets were well-constructed and on point. 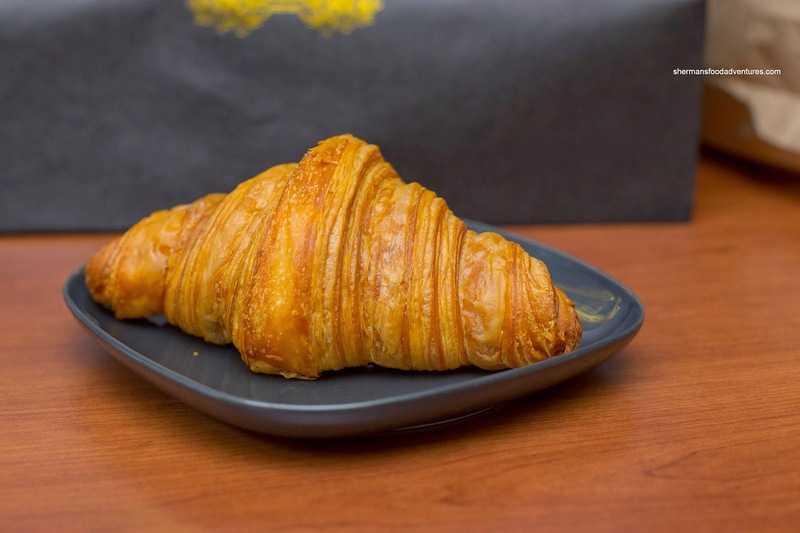 This is the only place in Richmond to get a decent croissant.